Pork is one of the most versatile meats for slow cooking, not just because it is tasty but because even processed pork meats such as sausage and bacon taste absolutely fabulous in soups and casseroles. There are few cuts of pork that can’t be slow cooked, but in particular the cuts to look out for are neck, tenderloin, shoulder, and fillet, all of which work well in the slow cooker. Neck of pork is rarely seen in supermarkets but you may find a local butcher or farm shop that sells it, it’s a very cost-effective meat with a superb flavour. It’s vital to note that while pork can make fantastic, tasty, moderately-priced slow cooker meals, it must be adequately cooked. Pork is particularly rich in the parasite trichinella spiralis which causes an illness called trichinosis in humans if they eat undercooked pork but as long as the meat is cooked to an internal temperature of 160 degrees Fahrenheit or 72 degrees Celsius, this parasite along with the bacteria that are likely to be present on any meat, such as: salmonella, staphylococcus and listeria will all be destroyed. Pork has several advantages for slow cooking: the meat is never tough and its dense texture doesn’t become stringy through overcooking as other meats can do. Large pork joints can be sliced easily with the leftovers being used in sandwiches and snacks and pork has very little cooking smell, so if you use a slow cooker, it doesn’t make the whole house smell strongly. Never defrost pork in the open air. It’s best defrosted in a refrigerator, at least overnight and it fresh or defrosted pork can be kept in a fridge for up to four days. Never return pork to the fridge after taking it out for more than a few minutes. 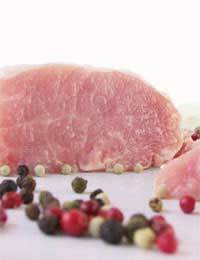 Do not store raw pork (or any meat) higher than other foods in the fridge – always ensure it is on the bottom shelf to prevent meat juices spilling onto other food. A rough rule of thumb when using a slow cooker is to remember that an hour on the High setting is around two on Low. Both these settings are above the minimum safe temperature for cooking meat, but if you put frozen meat (or vegetables) into the slow cooker, the temperature may drop for quite a while. So when cooking pork, first seal the pork in a pan and then make sure that everything you cook with it is at least at room temperature. Make sure you don’t fill your pot too full, as foods will not cook properly if it is overfilled because the heat may not circulate properly. Never lift the lid, because each time you do, the heat that escapes means you need to extend the cooking time by twenty minutes. Pork’s dense light flesh and tender flavour works especially well if the accompanying flavours are slightly acidic – vinegar is one such seasoning, and the other traditional one is fruit: choose from pineapple, cranberries, apricots and the traditional and very tasty apple sauce! Spices that give a zing to pork are juniper, rosemary and sage and when cooking in a slow cooker or crock pot, pork cooks beautifully with vegetables such as carrots, celery and cabbage. So, if I leave the crock pot on low setting for 6 hours, raw pork belly should be safe to eat, right? The recipe I'm following didn't specify if the pork had to be cooked or not before putting it in.